Constructing a pool that is beautiful and will be able to last for many years to come without needing repairs consists of several steps. The first two stages of our pool project for the Texican hotel in Irving, TX, were focused on soil stabilization using chemical injection and creating a firm foundation for the pool by pouring our base & laying 1/2″ steel rebar, and we have now reached the pool wall construction phase. We have done extensive research on the best materials for each phase of the pool building process so that we can construct the best pools for our clients. For this particular phase, we have determined that geofoam is the best material to use. 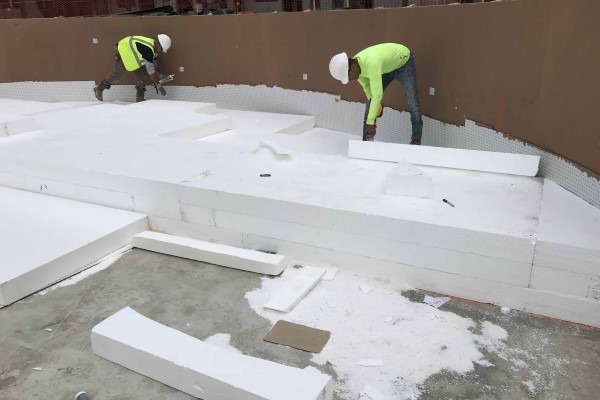 The benefits of using geofoam are many, and we thought we’d take the time to list them out as we outline our process for applying this material. Geofoam’s high elasticity makes it a perfect barrier to protect our pool shell from the expansive soil conditions of North Texas. Gunite shells are strong but can crack easily due to surrounding ground movement. 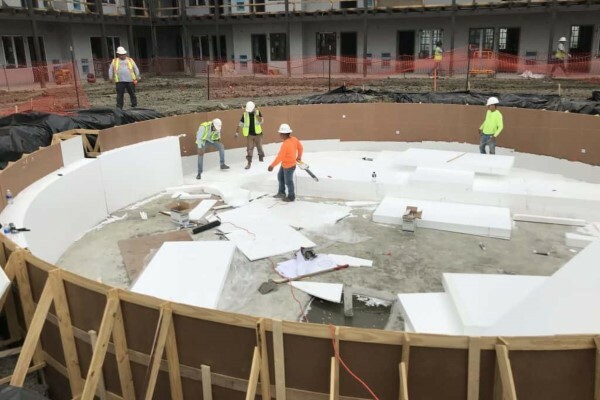 Geofoam is easier to work with and more efficient to install than standard fill materials commonly used throughout the pool industry. Our team measures and cuts the foam in the field to make the whole process easier. We’ve ordered more foam than we think we need and in sizes that are larger than our desired cutouts, which gives our crews more freedom to utilize these materials as needed for a faster and more efficient installation time. We install the geofoam outside of our concrete pool shell so that it can act as a protective barrier against moisture and ground movement. When installing the geofoam, we make sure to stagger the blocks so that the joints aren’t on the same vertical plane. It’s sort of like laying bricks – you want to overlap the layers in order to create a more stable foundation. Unlike other pool bases, Geofoam allows shotcrete or gunite to be applied directly to it. This adds to the many cost-saving and time-saving benefits that geofoam offers. Summerhill Pools has over 30 years of experience constructing pools, and we always stay up to date on the best construction methods and best materials to use. If you’re looking for a well-constructed pool that will require little to no maintenance for many years to come, contact Summerhill Pools today.